It was supposed to be a pleasant drive to the country for a morning hike, but what happened on the road left me wondering if Doc would end up on a Friday night episode of Dateline, Unsolved Mysteries. Anytime we head somewhere new I get a giddy feeling inside. On the way I fantasize about all the new things I will smell, little critters I can chase and just the beauty of being back to nature with Doc. Everything was quiet as we were headed down the highway when suddenly Doc slammed on the brakes. Startled back into reality I looked out the window and saw a large beast with feathers sitting in the middle of the road. It was a big Tom turkey. Doc waited a minute to see if it would move, but it just sat there. Then she honked the horn. 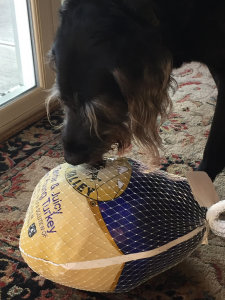 “Beep, Beep!” That turkey glared at Doc in the eye like she was the one in the way. She couldn’t drive around it because the road had a steep embankment on either side. She would never run over another living being with her car and I was too scared to chase such a strange-looking creature. So there we sat like cowboys in an old western waiting for the show down to begin. Weeks went by and to tell you the truth the whole incident was just a distant memory. It was getting close to Thanksgiving and I was thinking about all the good leftovers I would get. One day Doc came home and I could tell she was in a good mood. I noticed she was holding a large heavy bag with two hands. ” Look what I have.” she said. When she pulled the thing out of the bag I stopped in my tracks and gasped. It was a very large decapitated turkey. I approached slowly to examine it and noticed the poor things name was on the wrapping. Butterball was now dead and living in our fridge. What had Doc done? On Thanksgiving day the family came over and we ate Butterball down to the bones. The evidence now gone, I swore to myself that I would never say a word about that day on the road. It’s amazing the emotions and memories that a picture can evoke. Recently Doc was given a drawing in a black frame titled “All is Vanity.” It belonged to her grandfather and the drawing is well over 100 years old. Well before Doc was born, it hung in her grandfather’s dental office. Doc told me that she never remembered it until her grandparents moved to Columbus where it hung in their apartment and later in her grandfather’s bedroom when he moved in with her Aunt Pat in his later years after his wife had passed away. Doc told me that when she would visit her grandfather she would sit and study the drawing and found it to be both fascinating and scary at the same time. 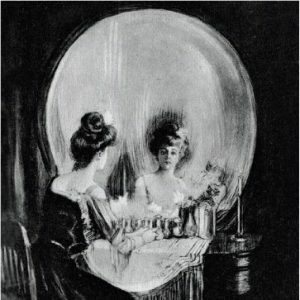 The artist, C. Allen Gilbert drew the picture to remind us about the vanity and pride of man and as an allegory of death. When Doc’s grandfather would see her gazing at the picture, they would talk about what the drawing meant. With all those discussions so many years ago, she didn’t understand the emotions that were being attached to that drawing until the day the picture found its way back to her. One day her niece called and told her she had acquired the picture from another family members estate and wondered if Doc would like it. When her niece came over and handed Doc the picture, she was surprised at the well of feelings that came to the surface. She cried with happiness over seeing the picture again and she promptly hung it where she could see it every day. You see, I have learned from observing humans that when someone passes away the tangible objects that belonged to that person are the only things left and often bring comfort to the living. So it was for that simple drawing from Doc’s childhood so many years ago. The picture now has a new home and here it will stay until one of Doc’s family members becomes attached to it, knowing all the stories and generations of relatives that have cared for the woman who looks at her reflection. There are occasions that Doc and I work a 10 hour day. Now don’t get me wrong, she makes sure I am well taken care of during those long days, but come on, it gets a little boring at some point. It is in the height of that boredom that I find things to entertain myself and not all of them are Doc approved. Recently she resurrected one of my stuffed toys named Lamb Chop from puppy hood that she found buried in the deep dark bowels of her desk. Unbeknownst to me she had buried it there some four years ago after an alarming incident where I had ripped Lamb Chops eye off and ate it. (I had to do something the thing just kept staring at me, it was creepy). I guess she felt that I had finally reached a point of maturity and that I could be trusted again. To tell you the truth, at first it was comforting to see the little lamb and I immediately felt that warm and fuzzy feeling of comfort from my childhood. So today, while Doc was talking to one of the patients, she placed Lamb Chop on the floor and I immediately pulled her close to me and licked her fuzzy body with affection. From Doc’s perspective the reunion between lamb and dog was going fine. Or so she thought. Just when Doc was feeling comfortable about letting me play with Ms. Chop again, the unthinkable happened. There was a meeting down the hall and Doc left me alone with Lamb Chop. Everything was going fine until I glanced over and noticed that the one eye that was still left on the beast was staring at me. I waited patiently for Doc to return ( at least 7 minutes) until I just couldn’t take it any more and took matters into my own hands. I surmised that I could strategically begin dismantling it through the hole of the eye that was already missing. I thought Doc wouldn’t even notice if I pulled out a tiny piece of stuffing. I could easily hide that under my paw if I heard Doc coming down the hall. But isn’t that how all bad behaviors begin? You tell yourself it’s just this little thing, just this one time. 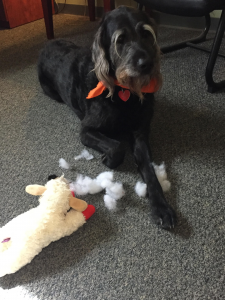 Well you guessed it, I just couldn’t stop myself and in the middle of dismantling poor Lamb Chop, Doc opened the door, looked down and caught me red-handed. She started shaking her head back and forth saying “Oh Grover.” Well that alerted all the staff who came running down to see what was going on. Surprisingly they took one look and burst out laughing. I guess I did look kind of funny laying there surrounded by stuffing with that sheepish look on my face. The biggest surprise came when Doc apologized to me. 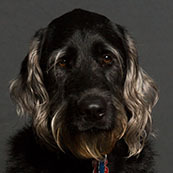 “Grover, I am so sorry that I put you in a situation that you were not ready to handle all by yourself.” And with that she picked up Lamb Chop, shoved the stuffing back in the eye hole and placed it back in the dark corners of her desk, probably never to be seen by this therapy dog again. Anytime someone says to you “Lets go to the graveyard on Halloween night, it’ll be fun…” run the other way. So, I allowed her to talk me into going because Doc usually makes very rational decisions. In hindsight, we should have stayed home like normal folks and passed out candy to the kids. Instead, we went on a ghost adventure and ended up in a frightening mess. It was an hour before dusk when we headed for the grave yard. We drove cautiously as there were children out and about in their costumes. Obviously distracted by their visions of bringing home the biggest candy haul in history. After driving to the out skirts of town, we came upon the entrance to the graveyard. From a distance it looked rather peaceful, but once I left the safety of the car I started getting the willies. The sun was setting quickly. I just wanted to appease Doc, get the heck out of there and go home. But Doc wanted the grand tour, so as we approached the back of the cemetery there was a large mausoleum. “What are we doing here and what is this thing?” I asked. 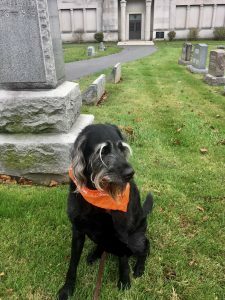 “There are people buried in there and they say if you knock on the mausoleum door you will hear someone or something knock in return”, she said. “Well why would we disturb the dead?” I asked, “That’s seems rude, don’t you think we should have called ahead to say we were coming?” Doc wasn’t listening and headed straight for the door. I gasped as she lifted her hand and banged on the door so hard, you could hear the echo inside of the chamber. We waited for a while and heard nothing. Thinking we would now leave, I turned toward the car. Then I heard Doc pound on the door again, but this time so hard that I’m sure it awakened the dead inside. Both of us stayed silent for a while, listening for any sound. It was eerily quiet and Doc had just about given up, when a low groaning sound could be heard on the other side of the door. Slowly the door of the mausoleum began to push open. Shaking with fear, we turned and ran for our lives before whatever was inside emerged. I swear to you, Doc jumped over those grave stones like an Olympic hurdler. It was impressive.